The Loral AN/ALR-56A RWR is designed to detect incoming radar signals, identify and characterize these signals to a specific threat, and alert the aircrew through the TEWS display. The AN/ALR-56 system features four external antennae mounted on the each fin tip and on both wingtips, with a fifth blade-shaped antenna underneath the forward fuselage. The solid state ALR-56 is based on a digitally-controlled dual channel receiver that scans from 6-20 GHz, while changes in the threat can be accommodated by software modifications. The ALR-56C Radar Warning Receiver (RWR) detects a broad range of incoming radar signals, identifies and characterizes the probable source as a specific friend or threat, and alerts the aircrew through the TEWS display. It also manages companion AN/ALE-45 and AN/ALQ-135 countermeasures systems. An F-15 Tactical Electronic Warfare System (TEWS) Operational Assessment report for the ALR-56C RWR (Suite 1 Operational Flight Program - OFP) was released by AFOTEC in Mar 95. RWR deficiencies included the following areas: memory capacity, processor throughput, threat ambiguity resolution, and false alarms. Future RWR improvements requested via the F-15 OFP update process could not be met (Suite 4 and beyond) unless a new processor and memory capacity upgrade program was initiated. Specific RWR SORD requirements were not met in Suite 2&3 due to current processor/memory limitations in selected threat environments. The AN/ALR-56M Advanced Radar Warning Receiver (ARWR) continuously detects and intercept RF signals in certain frequency ranges and analyzes and separates threat signals from non-threat signals. It displays threat signals to pilot on a priority basis and provides efficient and effective logistical support to the using command activities for the system. It contributes to full-dimensional protection by improving individual aircraft probability of survival through improved aircrew situational awareness of the radar guided threat environment. An RWR processor/memory capacity upgrade was required to allow incorporation of software algorithm enhancements (RAD, etc) to fix known threat ambiguity and false alarm problems. The F-16 SPO initiated an ALR-56M processor upgrade program which will provide a common processor for both the ALR-56M/56C configurations; the F-16 SPO committed funds to the common NRE tasks and the F-15 SPO is required to only fund unique F-15 RWR requirements. This upgrade will replace 7 SRUs with one. The ALR-56M includes a fast scanning superhet receiver, superhet controller, analysis processor, low band receiver/power supply, and four quadrant receivers. The ALR-56M is designed to provide improved performance in a dense signal environment and improved detection of modern threat signals, as compared to the version of the ALR-69 which it replaced. A miniaturized version of the F-15's ALR-56C, the ALR-56M is a form and fit replacement for the ALR-69 RWR in the F-16 and other aircraft. It is installed primarily in F-16 Block 40 (Close Air Support - CAS) aircraft and above. 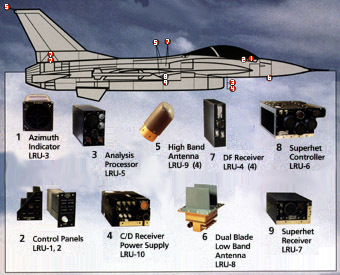 ALR-69 upgrades are ongoing for earlier blocks of the F-16 and some other aircraft. The ALR-56M is the RWR chosen for integration into the open architecture Defensive System Upgrade Program (DSUP) in the B-1B bomber Conventional Mission Upgrade Program. The Air Force identified a requirement in 1980 for a replacement for the ALR-69 RWR in F-16 aircraft. An AFOTEC OA on the pre-production ALR-56M, contributed to its 1988 selection to fill the requirement. The Air Force contracted for system development (19 Lot 1 systems) with options for two additional low-rate production lots (about 100 systems each). Problem areas identified in the OA included failure to fully meet user requirements in threat identification (ID), threat response time, and azimuth accuracy. System availability was undetermined. Based on the DOT&E assessment concurring with the OA problem areas and that the competition systems were not representative, DoD OUSD(A) withheld funds for the optional Lot 3 LRIP until further OT was performed and the DOT&E assessment of system effectiveness was positive. Two series of OT were conducted in accordance with a DOT&E approved TEMP and OTPs. The first series of tests, completed in January 1991, showed the Lot 1 system installed in a Block 25 F-16C (a Block 50 surrogate) were improved over the fly-off system, but did not meet all effectiveness requirements. A second series of tests, on the modified (hardware and software retro-fitted into production units) Lot 1 system, conducted as approved by DOT&E, and completed in September 1991 supported the Lot 3 LRIP decision. IOT&E included combined DT/OT events at the Dynamic Electromagnetic Environment Simulator at Wright-Patterson AFB, and the Pre-flight Integration of Munitions and Electronic Systems facility at Eglin AFB. Flight testing was at the Electro Magnetic Test Environment range at Eglin AFB. In January 1992 DOT&E approved an OTP for additional IOT&E of a Lot 2 production system in a Block 40 F-16. This phase of testing concluded the continuum of IOT&E, supporting the December 1992 DOT&E BLRIP report that the AN/ALR-56M is effective and suitable, which supported the Lot 4 full rate production decision. The AN/ALR-56M RWR remains on oversight in part because the National Defense Authorization Act for FY89 Conference Report (H.R. 4481, page 345), "directed that all future operational test results for RWR update programs be reviewed and approved by the Director of Operational Test & Evaluation, prior to obligation of production funds". In addition, the 1992 DOT&E BLRIP report recommended FOT&E as follows: "Because of the deferral of tactics verification testing and the concern about bearing errors and delayed deletions during extensive maneuvers, follow-on operational testing should be conducted to address tactics and survivability. The current TEMP calls for additional ALR-56M testing as part of continuing Block 40 and Block 50 F-16 follow-on testing." FOT&E has been conducted by the USAF Air Combat Command, Air Warfare Center (AWC) on subsequent software versions (SWVs). FOT&E in 1993 resulted in SWV 0011 being fielded. FOT&E in 1995 resulted in version 0020 being fielded in 1996. ACC has continued routine upgrades to Mission Data Table software to keep pace with changing electronic order of battle priorities for various geographical areas of operations to which the system is deployed. No substantial changes have been made to the cited feature of ALR-56M designed performance concerning bearing errors and delayed deletions during extensive maneuvers. However, tactics verification testing during FOT&E resulted in notations in the ALR-56M User's Handbook concerning the operational significance of this performance feature. The item is a training issue in order to ensure that aircrew understand ALR-56M performance during such maneuvers. Test activity involved ALR-56M weapon system sustainment block cycle/operational flight program (OFP) change activity for FY97. A broad summary of the software changes in this update includes: (1) update of Mission Data (MD) threat parameters; (2) improved threat information interface with the ALE-47 (expendable countermeasure dispensing system) OFP 1020; and (3) improved detection of emitters with complex waveforms. A combined DT/OT was planned on ALR-56M SWV 0030. Initial lab tests revealed major software problems that would prevent fielding of the ALR-56M SWV 0030. The problems could not be resolved in time to meet the recommended fielding date and the update requirements were forwarded for incorporation in the version 0040 test schedule. The originally planned SWV 0030 updates are now planned for incorporation into the SWV 0040 test schedule. SWV 0040 is already under contract and is scheduled for combined DT/OT testing from June 1998 to June 1999. SWV 0040 will include new computer hardware and re-host of the execution software language to ADA. DOT&E staff have monitored the activity and T&E process through dialogue and visits, and review of reported results. The TEMP has not been updated since IOC, and sustainment FOT&E test plans are not being submitted for DOT&E approval. T&E planning associated with new platform integrations and acquisition of the AN/ALR-56M (such as its inclusion in the B-1B DSUP architecture) will be specifically reflected in the TEMP and Test Plans for the new platform and/or defensive system architecture (e.g. the B-1B Conventional Mission Upgrade Program Block F (DSUP) TEMP Annex, and associated Test Plans). The T&E process utilized in testing the AN/ALR-56M involves a sound mix of hardware and software in the loop testing and flight tests. In this case, initial lab tests revealed major software problems and SWV 0030 was not fielded.